What Else Can I Expect From an Online Bachelor's in Social Work Program? By pursuing a social worker degree online, you open the doors to a growing career field that's focused on helping others. While social workers do not typically earn top salaries, professionals in the field are in high demand, and the U.S. Bureau of Labor Statistics estimates a 12% growth in the field over the coming years. Social workers assist people in a variety of ways. For example, they help others cope with the challenges of addiction, mental illness, poverty, domestic violence, and criminal issues. It's an extremely rewarding field that's best suited for individuals who care about others and have a talent for connecting with people. As a social worker, you can make a real difference in the lives of others. Graduates of social work programs assist people facing various life challenges, including homelessness, addiction, mental illness, poverty, and domestic violence. Read more here..
To earn a degree in social work, students must have an interest in helping others. Once admitted, students must meet all graduation requirements, which may include an internship or practicum component. Read more here..
CAN YOU BE A COUNSELOR WITH A SOCIAL WORK DEGREE? Yes. Social workers can work as substance abuse counselors, group counselors, residential counselors, family counselors, or school counselors. Read more here..
WHAT IS A BACHELOR'S DEGREE IN SOCIAL WORK? A bachelor's degree in social work provides students with fundamental human service and behavior skills. Graduates can go on to pursue graduate studies in social work or pursue entry-level careers in the field. Read more here..
HOW MUCH DOES A SOCIAL WORK DEGREE COST? The cost of a social work program depends on a number of factors, including residency status. On average, online students can expect to pay between $160 and $650 per credit. Read more here..
As you complete your social worker degree online, you learn a wide range of tools and techniques that are invaluable while working in the field. In most cases, students take courses focusing on interpersonal and intercultural communication, cultural anthropology, human growth and development, sociology, and psychology. After that, they engage in more program-focused coursework like child welfare studies, community mental health, social welfare, and research methods. Most social work programs involve an internship or field practicum component, during which you work in real-world settings and learn from experienced professionals in the field. This may include spending time at a public health clinic, mental health facility, courthouse, school, or senior center. Bachelor's of social worker programs online increasingly emphasize how best to communicate and work with individuals and families from diverse cultures and backgrounds. To that end, it's important for students entering the field to absorb as much as possible about topics such as cultural diversity, environmental sustainability, and social policy -- and how they impact people and communities. Appalachian State University offers nearly 40 online programs, including certificate and doctoral programs. The university boasts many fully online and hybrid programs, allowing students take courses online and at Appalachian's Campus in Boone, North Carolina. Appalachian's bachelor of social work program holds accreditation from the Council on Social Work Education. Graduates often find positions as community outreach workers, juvenile court liaisons, and rehabilitation caseworkers. The curriculum comprises foundational coursework, professional courses, and electives. Students complete courses such as cultural competencies in the workplace, social work practice and substance abuse, and research methods. The program culminates in a one-semester social field experience, during which students work full-time in a social work setting. Full-time students take courses during the day and typically complete the program in two and a half years. Part-time students take evening courses and graduate in as few as three years. Appalachian delivers online courses synchronously; students receive face-to-face instruction from certified instructors. Applicants must have completed at least 60 credit hours from an accredited college or university with a minimum 2.25 GPA. Of the program's 122 required credit hours, students must earn at least 52 through Appalachian. Applicants without certain prerequisites, such as biology or psychology, can take courses online through Appalachian before beginning the social work program. The university offers start dates in the fall and spring. In-state students pay a discounted tuition rate. Appalachian offers a tuition reduction program for active military personnel and veterans. Founded in 1958 in California, Brandman is one of the few accredited online schools for social work intended specifically to serve adult students. The college offers a wide range of online courses suited to the needs of non-traditional students, with campus centers located through California and Washington State. The school's Bachelor of Arts in Social Work emphasizes the field's social, political, and cultural dimensions, preparing graduates for work in community outreach, nonprofits, government organizations, and even clinical research. Building skills in both organizational dynamics and the use of technology, the program trains students to better serve the needs of diverse communities. As the program is intended for nontraditional students, applicants to the online degree in social work must possess at least 12 transferable baccalaureate (undergraduate) credits from a regionally accredited college, along with official transcripts from any college or university previously attended. The program curriculum includes 42 core discipline credits, covering topics such as human behavior, social environments, social policy, and interviewing and assessment skills. Students refine their focus through two additional elective courses, allowing them to study topics such as domestic violence, child abuse, military social work, and victim advocacy. The curriculum core also includes three courses in social work practice, focusing on individuals and families, groups, and organizations and communities, along with three practicum courses. These courses require 400 hours of supervised practice in a social service setting, giving students the opportunity to apply academic theories to professional practice. Prior to beginning the practicum, students must receive approval from the program director and complete a readiness interview. Brandman's multiple campus locations around the West Coast make it easy for the school to help students arrange practicum experiences near their own communities. Utah's flagship public college, U of U is based in Salt Lake City and serves more than 31,000 students, making it the third-largest college in the state. The school offers a Bachelor of Arts in Social Work, training students to support marginalized communities, from indigenous populations and refugees to rural residents and people of color. U of U's social work degree is one of the top programs in the region, and one of the few online colleges for social work with accreditation from the Council of Social Work. This fully asynchronous program combines both independent and interactive learning, giving students the flexibility to work at their own pace while still maintaining a learning community through interactions with other students. The social work program operates on a cohort model, which has students take the same sequence of courses together throughout the course of the program. U of U's curriculum requires 51 major credits, including unique courses that highlight marginalized groups, such as Native Americans in modern society, immigration and resettlement, and understanding substance abuse. The program also covers practical topics such as social work statistics and advanced social work writing. Students complete a practicum course, which takes the form of an internship at a social services agency, along with an honors thesis, which requires significant research in a social work area of the student's choice. All students in the program must complete U of U's general education requirements and specific social work prerequisites, which include liberal arts courses in psychology, sociology, and the U.S. government. Currently, not all general education courses are available online, but undergraduates can combine some campus courses with online courses in the school's hybrid education program. After completing general education requirements, the rest of the social work degree is available fully online. NSU is a regional public college that is part of the University of Louisiana System. Focusing on practice, research, social policy, ethics, and both social and economic justice, the school's Bachelor of Social Work prepares students to either enter the field immediately upon graduation or pursue advanced education. Students interested in pursuing one of the school's graduate social work programs will find the program especially efficient, as credits from the bachelor's program may fulfill up to half the credit requirements for the master's degree. Students earning their social worker degree online build a foundation that serve as the base of different areas of the field, from substance abuse and mental health to family services and child welfare. This makes the degree an ideal choice for undergraduates who are uncertain about precisely which career they wish to pursue. Online students at NSU do not pay out-of-state fees. Requiring 120 total credits, the program includes three courses in generalist practice, introducing student to the concepts and processes of general practice intervention. The curriculum also includes specialized courses, such as economics in social work, human sexuality, and protective services in child welfare. NSU requires degree candidates to complete 6-12 credits of field work over the course of two semesters. The field work component includes 16-32 hours per week of supervised field education in a social work setting, along with a weekly seminar that has students reflect on their learning and relate theory to practice. NSU recognizes learning from experience, and adult students may qualify for the school's Prior Learning Assessment program, allowing them to earn academic credit through portfolio writing courses that highlight their relevant life, volunteer, or work experiences. The most recent addition to UNK's online offerings is the bachelor of science in social work program. The online social work program receives specialized accreditation from the Council on Social Work Education; this accreditation ensures advanced standing and allows graduates to earn a master's degree more quickly than other students. Most students complete the bachelor's degree in four years. Graduates often work in the fields of mental health, public health, and substance abuse. The 120-credit, synchronous curriculum includes general studies courses, unrestricted electives, and major courses. Courses cover topics such as human behavior in the social environment, research fundamentals, and social justice. Through 11 electives, learners customize the program to fit their career goals. Students complete two local field placements. Students arrange to take proctored exams at local testing centers. Freshman applicants must submit high school transcripts. UNK awards unconditional admission to students who have passed core high school courses and met standardized test benchmarks. Applicants younger than 21 must submit SAT or ACT scores. UNK offers discounted tuition rates for Nebraska residents and a financial aid program for veterans and their families. In-state and out-of-state students can qualify for academic merit scholarships. ENMU was founded in Portales, New Mexico in 1934, making it the youngest public college in the state. The school's 5,500 students enjoy a range of convenient online programs, and ENMU ranks as one of the top accredited online schools for social work in the Southwest. Intended for both current social workers and those looking to enter the field, the Bachelor of Arts in Social Work explores the relationship between people and their environment, with an emphasis on values of service, human dignity, economic and social justice, and the importance of human relationships at the individual, family, and community level. Complying with the standards and guidelines set by the Council on Social Work Education, the program trains students to become competent and caring social workers with a strong ethical practice. Graduates of ENMU's online accredited social work programs may be prepared to take the New Mexico social work licensure examination, and undergraduate credits may also be applied toward advanced standing admission into the school's master's in social work program. The degree requires 120 total credits, with 38 hours of general education requirements and a minimum of 61 hours of social work courses. Some of the program's notable courses include public child welfare, working with aging populations, and Southwest peoples and cultures. Students also complete a pair of three-credit field placement experiences, allowing them to intern in a professional social services environment. While major coursework for the degree is available primarily online, students are required to travel to campus 2-3 times each semester. Additionally, some general education requirements and recommended electives may be unavailable online. All major program courses can be completed within two years of full-time study, but students must complete all general education requirements before entering the program, whether at ENMU or another college. A major public research college in Flagstaff, Arizona, NAU serves more than 30,000 students, making it one of the larger schools in the region. The college's Bachelor of Arts in Social Work gives students the skills to facilitate change for underserved groups, with an explicit emphasis on the Southwest's rural and indigenous populations. The program's major goals include combatting poverty, systemic racism, and oppression; developing leadership that promotes social justice and human rights; and advocating and serving all vulnerable populations. The program is available entirely online, though students in the Flagstaff area can choose a blended format that includes some courses at the NAU campus. This 120-credit degree includes a liberal arts core, along with 75 credits of major-related requirements that prepare students to address contemporary issues in social work, including substance abuse and homelessness, and physical, mental, and behavioral illnesses. Students also gain relevant skills in research, statistics, and information technology literacy. The major includes 15 credits of a behavioral science cognate, with courses in ethnicity, gender, human biology, indigenous populations of the Southwest, and social and economic justice. During their senior year, students complete a 12-credit field placement experience that allows them to apply program learning to hands-on work at a social services organization. Students end the program with a capstone course that integrates the overall social work curriculum with concepts of professional practice and the implementation of change through leadership. Online students at NAU receive significant support in the form of online class resources, including library services and tutoring. The school's Student Learning Centers connect students with online tutoring services for all subjects, while the NAU library offers access to a huge collection of research materials available fully online. The college also maintains 22 campuses throughout Arizona, which provide in-person resources such as computer labs, tutoring, and IT services. Founded in Alabama in 1887, Troy University enrolls 11,000 students and offers nearly 50 undergraduate certificate and degree programs. The university offers a fully online bachelor of social work program, which most students complete in four years. Graduates often work as school social workers, community service managers, and correctional treatment specialists. The 120-credit curriculum emphasizes community experience alongside classroom instruction. Students complete core coursework and social work professional requirements, which include courses in diversity and human behavior, plus two independent research courses. Students work alongside and interview social workers in their community. During the latter half of the program, students undertake a 400-hour practicum experience. The practicum experience provides an opportunity for students to apply learned concepts and exposes students to the variety of available social work careers. Freshman applicants must submit SAT or ACT scores and must hold a minimum 2.0 GPA. All online students pay the same tuition rate, regardless of state residency. The university reviews transfer credit on an individual basis and sets no maximum number of transfer hours. Troy supports active military personnel and veterans and assists them during their transition back to civilian life. Troy offers opportunities for active duty Navy and Airforce personnel to take courses while on base or during deployment overseas. After earning an associate degree in the field, many students pursue a bachelor's degree at one of the many online schools for social work. Based in Minnesota, Bemidji State University offers a hybrid bachelor of social work program that is ideal for associate degree holders. Unlike other online social work programs, students progress through BSU's cohort-based program with groups of peers and typically graduate in two and a half years. Students meet on campus one Saturday per month to apply skills learned during online coursework. The 69-credit curriculum builds on the knowledge students gained during associate programs. Students take up to three synchronous courses per month. Required courses include family dynamics, human behavior in social environment, and a research seminar. Electives focus on serving minority communities in Minnesota and surrounding states. Students can also elect to complete a chemical dependency minor or an alcohol and drug counselor certification. The program culminates in a capstone course involving a 480-hour internship. The program accepts a new student cohort every two years. Applicants must have earned an associate degree with at least a 2.25 GPA. All online students pay in-state tuition rates, regardless of residency. BSU offers five scholarships exclusively for distance learners, and the university provides additional scholarship opportunities for military students and veterans. Chico State's accelerated bachelor of arts in social work program is designed for Northern California residents planning to transition into a social work career. Full-time students can earn the degree in two years, and part-time students can graduate in as few as three years. Many graduates work in the criminal justice, rehabilitation, and mental health fields. Students in the 120-credit program take two-thirds of required courses online and complete remaining coursework at the Chico campus during two weekends per semester. This hybrid format is ideal for local students who work full time. The core curriculum requires 12 courses, and students complete a field placement; students with positions in social work may use their job site as a field placement. Chico State accepts up to 70 transfer credits, and the ideal applicant holds an associate degree or has completed two years of college. Chico State offers start dates in the fall and spring, and students who have resided in California for at least one year pay a reduced tuition rate. Students earning their social work degree online can apply for multiple scholarships and stipend opportunities. Chico State offers scholarships and specialized financial aid services for veterans. Founded in 1965 in Denver, Colorado, Metro State is a major public college with a student body of more than 23,000. Students earning their Bachelor of Science in Social Work gain perspectives on personal, interpersonal, and societal issues, building skills to work individual clients, families, and groups. The program examines the factors of social inequalities, from race and class to age and ability status, giving students the skills to facilitate positive social change for vulnerable populations. While the program is available fully online, admission is open only to Colorado residents. Online students may also be required to participate in extracurricular virtual seminars to develop a stronger sense of community among peers and faculty members. The program includes 120 total credits, with 36-42 credits dedicated to general studies, 5-7 credits for social work prerequisite course, 55 credits for the social work major, and 16-25 additional credits for general elective courses. Students complete most major coursework during their junior and senior years, which cover topics such as the philosophy of social work, agency experience, and privilege, oppression, and power. The curriculum also requires students to complete eight credits of fieldwork experience, developing the skills, knowledge, and values necessary for professional practice in a supervised social services environment. Students pair the fieldwork experience with a two-part applied practice evaluation, which has them conduct a program evaluation of their field placement and present their findings through a written and oral report. Metro State social work students are eligible for several scholarships available specifically to the social work department, including the Social Work Scholar Award, Social Work Leadership Award, Social Justice Advocate Award. Students can be self-nominated or nominated by any staff member, student, or faculty member of the Department of Social Work. Detroit, Michigan is home to WSU, a public research college and one of the state's largest schools. More than 28,000 students call WSU home, served through a main campus, two extension centers, and a significant online learning program. The school's Bachelor of Arts in Social Work emphasizes a generalist perspective toward the field, training students for ethical practice serving poor, vulnerable, and diverse populations, particularly in urban areas. The program boasts small class sizes that offer individualized attention and strong faculty mentoring, and WSU students have opportunities to engage in leadership development, community activism, and volunteering. Overall, students in the program learn to recognize the dynamics that lead to negative social circumstances and gain strategies to alleviate these problems, giving clients the opportunity to improve their quality of life. The entire program curriculum is based around four intersecting themes: oppression and discrimination, social justice, values and ethics, and populations-at-risk. Students complete 120 total credits for the degree, with 60 credits of general education requirements during freshman and sophomore years. During their junior and senior years, students take an additional 60 credits, with 51 credits dedicated to social work major courses and nine credits in general social work courses. (Students with 60 credits from another accredited institution who have completed relevant pre-professional coursework can transfer into the program as juniors.) The social work curriculum centers on five academic areas: human behavior and the social environment, research methods, social work practice, social welfare policy and services, and field education. Field work for the program emphasizes urban populations in a variety of social services settings. Interested students can apply to participate in the Wayne Together Collaborative, which provides in-depth training in child welfare through a partnership with the Michigan Department of Health and Human Services' Children's Services division. Based in Owensboro, Kentucky, BU is a private Catholic college affiliated with the Ursuline Sisters of Mount Saint Joseph. The school is a strong proponent of adult education, and its Bachelor of Social Work is designed with professional students in mind, offering a flexible online course schedule and five start dates throughout the year. 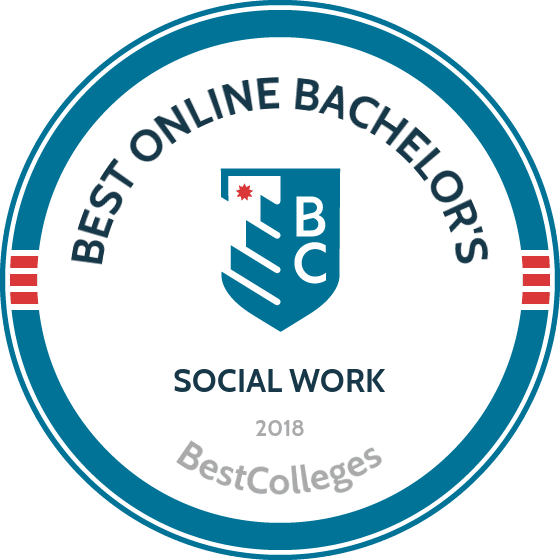 BU's degree ranks as one of the top online accredited social work programs in the region, with full accreditation from the Council on Social Work Education. The program prepares students to assume leadership roles in social services and related organizations, from child services and criminal justice to anti-poverty programs. The program curriculum includes 128 total credits, with 57 hours of general course requirements and 42 hours of major-related courses. Major courses include fundamental topics in human behavior, social welfare policy, and research methods. Students also complete several credits in both field practice and practicum, allowing them to gain in-depth experience in a professional social service setting. The practicum includes a weekly classroom seminar that allows students to connect academic concepts to professional practice. Students also take a research course that requires them to perform original statistical research and analysis, presenting their findings to social service constituents. BU's online bachelor's in social work is a degree-completion program, and students must possess 45 credits to qualify for admission, with required courses in social work, sociology, psychology, biology, and math. Students lacking proper undergraduate credits can enroll in BU's associate in human services degree program instead, which is also available fully online. Students who are already employed in the social work field may be able to forgo some program credit requirements, but those without professional experience must either complete the associate degree or possess adequate credits to transfer. More than half of SAU students complete their degrees online. The university offers more than a dozen online programs, and Michigan and Ohio residents can earn their degrees in a hybrid format by taking courses at one of SAU's satellite campuses. The fully online bachelor of social work program holds accreditation from the Council on Social Work Education. Graduates often work in hospitals, nursing homes, and domestic violence centers. Students earning the social worker degree online complete 124 credits, including courses in race relations, social welfare policies, and interviewing skills. The program concludes with two capstone courses, during which students apply classroom knowledge to 400 hours of work experience in a social service setting. Most courses last five to 15 weeks, and the university caps classes at 23 students. Michigan residents can complete an additional endorsement in child welfare. Full-time students with transferable credit can complete the online social work degree in as few as 20 months. Students complete general education requirements during their freshman and sophomore years and progress to social work courses after a departmental interview. Transfer students can apply up to 81 credits toward the degree. In-state and out-of-state students pay the same tuition rate. The university offers a discounted tuition rate to active duty military personnel and veterans. A private, non-denominational Christian institution in Gaffney, South Carolina, Limestone was established in 1845 as a women's college, making it the third-oldest school in the state and one of the oldest in the country to serve women. Today, the school serves students of all genders through its main campus, online programs, and a range of extension locations around the state. Students in Limestone's Bachelor of Social Work study patterns of behavior among individuals, families, communities, and organizations, examining social problems and exploring solutions to address and prevent them. The program helps students develop their understanding of the differences that affect society, such as culture, race, ethnicity, and gender, and the impact of these factors on social conditions and economic wellbeing. Even though Limestone is one of the largest online colleges for social work in the state, students benefit from a low student-faculty ratio that allows for personalized support and learning experiences. Students choose from either a fully online program or a blended mix of online and evening campus courses. With six academic terms per year, the program is ideal for working students who need to fit their education in around other obligations. Students interested in attending in-person courses can take advantage of the school's five extension campuses, which are located around the state and all offer evening classes that mix with online coursework. The social work program curriculum requires a minimum of 123 credits for graduation, including 48 credits in social work major courses. The program core includes courses that introduce social work concepts, along with specialized courses such as practice with culturally diverse populations, social work specialized groups, and the influence of sexual factors on behavior. During their senior year, students also perform 12 credits of field practicum, equating to 400 total hours of supervised work at a social services agency. Southern Arkansas University offers a bachelor of social work program in a hybrid format; students take courses online and at the Magnolia campus. Full-time students typically complete the degree in four years. The social work department is a multidisciplinary department and prepares students for a wide variety of careers and educational opportunities. The curriculum requires 123 to 125 credits covering essential skills such as technological proficiency and statistical analysis. SAU students must maintain a minimum 3.5 GPA to undertake the three required social work field practicums during their senior year. SAU delivers online courses through Blackboard. Students must complete general education requirements with at least a 2.5 GPA before beginning the social work program. Transfer students can fulfill general education requirements with previous coursework. Arkansas residents who hold an associate degree from an in-state community college can take advantage of the "2+2" program and earn their bachelor's in two years. Freshman applicants must submit SAT or ACT scores. SAU provides a specialized credit transfer process for military veterans and law enforcement professionals, taking into consideration both college credits and professional experience. The university offers a discounted tuition rate for Arkansas residents and provides merit- and need-based scholarships. Based in Campbellsville, Kentucky, CU was founded as a Baptist college, but today the school serves more than 3,200 students from all Christian denominations. In addition to ranking as one of the top online colleges for social work in the region, CU is also among the most affordable Christian colleges in the country, making it a popular choice for students throughout the region and around the nation. Historically a church social work program, the school's Bachelor of Arts in Social Work combines the essential principles of social work with Christian ethics and ideals, giving students the skills to serve client populations at the individual and community level. The degree prepares students to become generalist social workers, capable of assisting diverse populations through local, regional, and national programs. Students complete 120 total credits to graduate, with 42 credits of core major courses focused on human development, diversity, and social work practices. Nine additional credits in elective courses allow students to pursue professional interests, with options such as aging; child abuse and neglect; marriage and family; foster care and adoption; and introduction to counseling. Students can also pursue an independent study in social work, allowing them to research topics not covered by the standard curriculum. The core major curriculum also includes 12 credits (four courses) of practicum experience, requiring students to perform a total of 450 hours of supervised work at an approved social services agency. Undergraduates at CU are eligible to join Phi Alpha, the National Social Work Honor Society, after declaring a social work major and demonstrating significant academic achievement. Admission to Phi Alpha requires at least eight credits of completed social work courses, with a 3.0 overall GPA and a 3.5 GPA in social work courses. Aurora University offers online bachelor's degrees, master's degrees, and professional certifications. Students can complete the fully online bachelor of social work program in four years, and students with previous college experience can graduate more quickly. After earning the online degree in social work, graduates often pursue careers as behavioral management aides, healthcare social workers, and eligibility workers. The 120-credit program includes 40 credit hours of synchronous core courses, such as human behavior in the social environment, social work with groups, and an integrative seminar in social work. Students can take general education requirements and electives asynchronously, which is ideal for students with busy schedules. Each online course lasts eight weeks. During their final year, students complete 450 hours of supervised field instruction in their communities. Freshman applicants must submit SAT or ACT scores and high school transcripts. AU accepts transfer credit hours earned with at least a 2.5 GPA. Students complete general education courses and social work prerequisites before beginning the social work program. All online students pay the same tuition rate, regardless of state residency. Online students have access to scholarships, grants, and loans. ASU's bachelor's degree for social work program is ideal for Georgia residents with an associate degree in social work or significant college credit. Students in the hybrid program can complete general education requirements entirely online and take social work courses on campus. The program includes 42 to 44 credits of asynchronous online coursework, including requirements in English, history, science, and mathematics. On campus, students take advanced social work courses such as human behavior, individual and families, and interviewing and recording. Students choose from more than two dozen electives to tailor the degree to their career aspirations. Students participate in field experiences throughout the program and undertake a field practicum at a local social work agency during their final semester. ASU arranges field placements and ensures students receive guidance from a trained field instructor. Although ASU's online social work degree program is geared toward transfer students, incoming freshman are welcome to apply. All students pay the same tuition rate for online courses, and ASU offers a discounted tuition rate for Georgia residents in on-campus courses. Georgia residents also benefit from exclusive grant and scholarship opportunities. Students living near campus can take advantage of federal work-study programs. The university provides tuition assistance for military veterans and their families. In 2018, Victory Media recognized ASU as one of the region's top schools for veterans. Founded in 1897 in Huntington, Indiana, Huntington is a private Christian college affiliated with the Church of the United Brethren in Christ. The school's Bachelor of Arts in Social Work adopts a holistic, interdisciplinary perspective toward social work, emphasizing the psychological, biological, social, and spiritual aspects of the field. Arranged around values of dignity, integrity, service, and justice, the program addresses the 10 core competencies prescribed by the Council on Social Work Education, preparing students for entry level social work positions or graduate education. The program integrates Christian faith with personal and professional development, training students through a varied curriculum that includes classroom instruction, community service, field work, and global connections. Graduates are also prepared to gain social worker licensure in any U.S. state, making the program ideal for students regardless of future plans. Offered in a blended format, the program requires one weekly evening meeting held at either the Huntington, Fort Wayne, or Columbia City campus. The social work major includes 15 courses that cover both theoretical approaches and significant hands-on experience. Along with foundational courses such as introduction to social work and social work practices, the curriculum highlights unique topics like the interview workshop, which has students examine the interview processes used for professional interactions with clients. Students also gain significant professional experience through several hands-on learning experiences, including a job shadow in social work, a practicum in social work, an internship in social work, and a final senior practicum and seminar. Worth 12 credits and comprising the entirety of the final semester, the senior practicum is the most significant experience, entailing 480 total hours of supervised work in a professional social service setting, along with a comprehensive evaluation and reflective seminars held throughout the semester. In total, students perform over 600 hours of field work, which is far more than most bachelor's programs. The vast majority of bachelor of social work online degree programs prepare graduates for entry-level positions in the field as residential counselors, group home workers, and mental health assistants. While certain details will vary depending on specific schools, this guide is a good starting point to help you find the social worker degree online program that best suits you. Most social work programs online teach students to become generalists, thereby preparing them for entry-level positions or more specialized training through graduate programs. Nuances between programs exist based on the school's history, location, and influence of instructors who teach there. Below are some sample courses that provides a broad overview of what you can generally expect from this type of degree. Human Behavior & the Social Environment: This introductory course is common among social worker degree online programs. Providing a broad understanding of human developmental stages and the connection between human growth and the environment, this course prepares students for general entry-level work in the field as school counselors or case work assistants. Cultural Diversity: This course provides students with a general understanding of the history and challenges of oppressed people in the United States. By delving into their own ethnic and cultural heritage and looking at other minority groups, students begin to prepare for work with diverse populations as advocates and educators for a diverse approach to social work and community care. Death & Dying: This class focuses on the complex and various aspects of individual responses and cultural beliefs towards death and dying. It provides future social workers, particularly those who want to work with the aged, with some fundamental tools to help individuals deal with their mortality. They also learn to help grieving families heal after the loss of a loved one. Online colleges for social work require students to earn at least 120 credit hours to graduate. This usually takes four years of full-time enrollment. Students who have previous college credits can complete their bachelor's in social work in about two years. Some online programs exclusively provide a degree completion track and require applicants to have at least 60 hours worth of college experience before they can enroll in the program. Other factors that affect length are whether or not a program adheres to a cohort or individual learning model. Most programs have aspects of both in their curriculum. Cohort learning usually means distance learners advance through a linear degree plan with a group of peers, enabling them to build relationships and support each other during the learning process. This also means that certain classes are only available during certain semesters, which can be challenging for online students with full-time jobs or other obligations. An asynchronous, individual program allows the most flexibility and can be completed quickly. National accreditation is the most popular and comes from either the Council of Higher Education Accreditation (CHEA) or the United States Department of Education (DOE). Regional accreditation is the highest available from of accreditation. It ensures a school meets the educational requirements of the state or group-of-states within that particular area, a marker that almost all employers look for. There are six agencies recognized by CHEA and USDE as having the power to grant this designation. Fully accredited online schools for social work should have approval from the Council of Social Work Education, a private body that creates academic and professional standards of education in this field and ensures that programs meet certain standards. You should look for a program that has all three forms of accreditation. The most popular accreditation for nonprofit colleges and universities is at the national level and comes from either the DOE or the CHEA. The DOE recognizes seven regional accreditation organizations, while the CHEA only recognizes six. DOE approval is more important, though you should look for a social work degree online program that has both. For a list of accredited colleges and universities, see the DOE's and CHEA's websites. According to the Bureau of Labor Statistics, a bachelor's degree from an accredited online schools for social work is a requirement for most entry-level positions in the field. This is because a bachelor's degree prepares individuals for the challenges and opportunities of serving as a social worker, case manager, substance abuse counselor, or a related professional. All states also require social workers to be licensed and licensure is typically an option restricted to those who have completed a relevant four-year degree. As a result, individuals who have achieved an associate degree will not be able to practice in the field. While entry-level salaries for those who have received a degree from one of the online colleges for social work tend to be comparatively low, more experience translates to higher salaries. Consider the data below on median salaries for social workers and related professions from Payscale. Social Worker: The most common career path for those who take part in social worker programs online, these professionals work with individuals and families in a variety of settings. Social workers typically have strong communication skills and an ability to connect and build trust with others. Professionals in this field regularly handle large caseloads, making good time management skills a must. Substance Abuse Counselor: These professionals focus on addressing the needs of individuals dealing with drug and alcohol use and abuse. Their work may take place in group settings or through one-on-one meetings with clients, and they're often contracted by businesses and nonprofit organizations to assist employees. Many substance abuse counselors emphasize prevention and can recognize common signs of abuse in both children and adults. Child Life Specialist: Most often found in hospitals and other healthcare settings, child life specialists work with children who have serious medical conditions. These professionals help families cope with illness from a psychological, emotional, and physical perspective. Stress reduction, counseling, and care coordination are key components of child life specialists' work. Mental Health Case Manager: These professionals develop and implement care plans for individuals with mental illnesses, often coordinating these plans with doctors, home care providers, and family members. They also conduct regular check-ins with their clients to ensure that they remain on track with their care. School Social Worker: Typically focused on K-12 education settings, school social workers observe students and determine if they may be dealing with mental, emotional, or social challenges. If so, they work with teachers and parents to help students address these issues in positive ways. National Association of Social Workers (NASW): With more than 132,000 members, NASW is the largest professional organization in the social work field. The group offers professional development opportunities and advocates for sound public policies at the federal level. American Case Management Association (ACMA): ACMA offers professional development opportunities, networking, and advocacy related to laws and policies that impact the practice of case management across various fields. The Network for Social Work Management: This international association aims to strengthen the field of social work by providing a platform for its members to communicate, network, and share best practices. When searching through the various bachelor of social work online degree programs available, one of your concerns may be how you will pay for your education. Fortunately, a variety of resources are available, including scholarships and federal student aid. All students, regardless of their financial circumstances, should take the time to fill out a FAFSA form to find out if they are eligible for grants, subsidized loans, or work-study programs that can help fund their studies.